I’m no expert on Where Reading Is Going. I read our “Vision For 2050″ (which seemed to have precious little to do with Reading) and was none the wiser. I don’t understand what “Reading UK CIC”, “Living Reading” and the “Business Improvement District” actually are, or what they’ve achieved, and what with having an actual job I never get to attend cultural talks at 6pm on campus or the First Friday Club in Brown’s listening to the movers and shakers. I’ve never been to the Reading Cultural Awards or the Pride Of Reading Awards (Danyl Johnson’s one guaranteed gig every year). I wasn’t on the bus to Tate Modern recently to join a discussion about the arts in Reading, almost exclusively peopled by Reading folk, in London. I have no idea why we keep appointing people from out of town to run our cultural events instead of our excellent home grown talent. Answers on a postcard for all of the above, please, to the usual address. It does strike me though, in my ill-informed way, that Reading’s at a bit of a crossroads. What kind of town do we want to be? We could try to emulate somewhere like Bristol, with its blossoming cultural scene, superb market, brilliant food scene and countless independent shops. I love Bristol partly because it doesn’t try to be a lesser clone of anywhere. It ploughs its own furrow and – this is something Reading could really learn from – is fiercely proud of its culture, its history, its traditions, even the accent. Alternatively, we could simply become Zone 8 – added to the Tube network through Crossrail, with all the London chains expanding here and all the trends eventually arriving here too, a few years after they’ve stopped being hot. With the snazzy new Westgate Centre up the road in Oxford, we finally have some local competition. We may have a Franco Manca, but they have a Pizza Pilgrims. Oh, and Oxford has a Leon and a Thali Kitchen, neither of which currently operate here. The big brains of Reading must worry about how to guarantee their supremacy (it all reminds me of the legendary Reading On Thames take on Downfall). Where does Honest Burgers fit into that narrative? Not another chain, said some people when they announced they were coming to Reading. Not another burger restaurant, said others. But Honest is a more interesting beast than that. For a start, if it is a chain it’s a very small one – predominantly in London apart from a branch here and in Cambridge. The expansion seems slow, careful and considered rather than the result of a huge injection of capital and a relentless business plan (the way that all chains tarnish). Their story’s an idiosyncratic one, starting in Brixton Market, getting a huge publicity boost from shrinking violet Jay Rayner, and sticking to some resolutely uncommercial decisions from day one, most particularly to make their chips on the premises every day. The other interesting thing about Honest is their commitment to localism – working with producers to offer a special burger at each of their outposts, exclusive to that branch. That extends to Reading, where they’ve worked with Two Hoots Cheese and Nomad to supply Barkham Blue and red pepper chutney for a Reading burger. They also approached Wild Weather Ales, who brewed a special King St Pale for Honest: it’s served at the restaurant and a few other Reading pubs. In the interests of full disclosure, I had a few dealings with Honest in the run-up to their opening. I recommended local suppliers to them (including Two Hoots and Nomad), told them about our great pub and café culture and pointed them in the direction of other websites like Explore Reading which covered their launch so well. But the only freebies I accepted from them in return were prizes in the competition I ran in December, because I wanted to reserve the right to visit them on a weekday night, my trusty sidekick Tim in attendance, and decide for myself what Honest added to Reading’s culinary scene. Further evidence of Zone 8, or a different kettle of fish altogether? Honest’s respect for the town extends to the building they’re in. They spoke in interviews about falling in love with the space – half Brutalist, half Victorian – and they’ve done a terrific job of turning it into a restaurant. It’s a building I walked past countless times without noticing it but now it’s hard to imagine it was ever anything else, let alone the branch of Barclays I opened my first account in over twenty-five years ago. The main dining room is broken up beautifully into sections – booths around the edge for two and four people, all perched at windows looking out on to the street, long tables for solo and communal dining in the middle and more conventional seating (and banquettes) further up. The bar area – up a steep set of stairs at the Market Place end – looked a lovely place to spend time, although it was empty when I visited. The quality of the work is really impressive – striking light fittings rather than tired exposed bulbs, a gorgeous herringbone parquet floor running the length of the room and attractive hexagonal tiles marking out the perimeter where the booths are. By the time I arrived Tim was already seated at the set of tables nearest to the pass and, above the racing green tiles, I could see burgers ready to be taken to customers. There were only a few chefs on duty, all rush and fuss, but even watching them you got an idea of just how well-oiled a machine Honest’s kitchen is. It helps that the menu is on the border between simple and simplistic – a chicken burger, a vegetarian burger and half a dozen beef burgers, all served with rosemary salted chips. Add a handful of sides, a selection of sauces and that’s your lot. I figured I better had: it was about the third time he’d said it in the past few weeks. I also tried a sip of his beer, the King Street Pale. “Well, I guess. But it still tastes like beer.” I said, waving someone down and getting a pint of lager: Fullers Frontier, which was perfectly pleasant and just about under a fiver. Tim did the face that meant You’ll never understand beer, and I in return did the face that means I know, and I’m fine with that (we’ve perfected those over many pub and restaurant trips over the years). Tim initially wanted me to order the Reading burger. I can kind of see why – it had local roots, it sounded very nice and, I suppose, I had a small hand in it. I decided against it for a few reasons. It felt too obvious, for starters. Also, I knew all the other reviewers would try it, and I like being different. But most significantly, all of Honest’s blurb was about the beef, so I wanted to try the burger in a more traditional setting, to taste the ingredients singing with as few backing vocalists as possible. So I went for the Honest, which is their equivalent of a bacon cheeseburger. Tim, who had already tried a couple of things on the menu, decided to order the special, the “Disco Bistro”. By the time this review goes up, you’ll have about three days to try it before it’s replaced by something else, but I figured it was a good shout because, again, it says good things about Honest that they’re always experimenting (besides, there’s no arguing with Tim once he gets an idea in his head). This really is fast food; our burgers arrived less than fifteen minutes after we ordered. My first bugbear was that it came on an enamel tray with a knife but no fork, although we requested them and got them very quickly. Without a fork I’d have needed far more napkins than the handful at the table. And although there was a knife I’m not sure it was really needed as my burger was just the right size – and depth – to pick up and eat with your hands, which feels like a rarity nowadays. The patty was really rather good. Beautifully seasoned, with just a little salt coming through in each bite, perfectly pink on the inside but properly cooked and with plenty of char on the outside. Honest makes much of the fact that their beef is chopped rather than minced and it shows in the texture – coarse without being mealy or crumbly. The decision to use good mature cheddar was also a welcome one: I know bright yellow American cheese is authentic, but it’s always left me cold. The brioche was firm enough to hold together and made eating the burger really easy. So far so good, but for me the Honest didn’t quite work. I’d have loved onion in it, but instead it (and the basic burger) come with caramelised red onion chutney. The sweetness was cloying and felt like a bum note. Similarly the pickled cucumber could have been brilliant if it had lent a sharp, vinegary tang but instead was sweet and inoffensive. I found myself wishing their classic burger was just a little more classic. Tim on the other hand had gone for a full whistles-and-bells, kitchen sink burger. The “Disco Bistro” had pineapple and bacon jam, burger sauce, cheddar and pink onions. It sounded like it would either be triumph or disaster: Tim loved it. I also really enjoyed the chips. A lot of reviews I’d read said they were too salty, and I’d had reports to that effect, but on the night I visited they were about right. I’d have liked more rosemary coming through, but you couldn’t argue with the texture or the quality of them and they were especially good dipped in the bacon gravy. Yes, we ordered bacon gravy: a recommendation of Tim’s from a previous visit. Bacon gravy is such a beautiful concept that its existence is almost more important than minor details like what it tastes like. I liked it but I wasn’t completely bowled over – it was still a little thin, if salty and meaty (and I wasn’t sure how much of it was bacon – the menu says it’s bacon gravy, the blackboard says it’s “beef and bacon gravy” and it felt more beef than bacon to me). The other issue with it is that it comes in a shallow enamel dish which means it goes cold fast, something you could probably say about most of the meal. In fairness, Tim and I had a good go at making sure none of it had the chance. 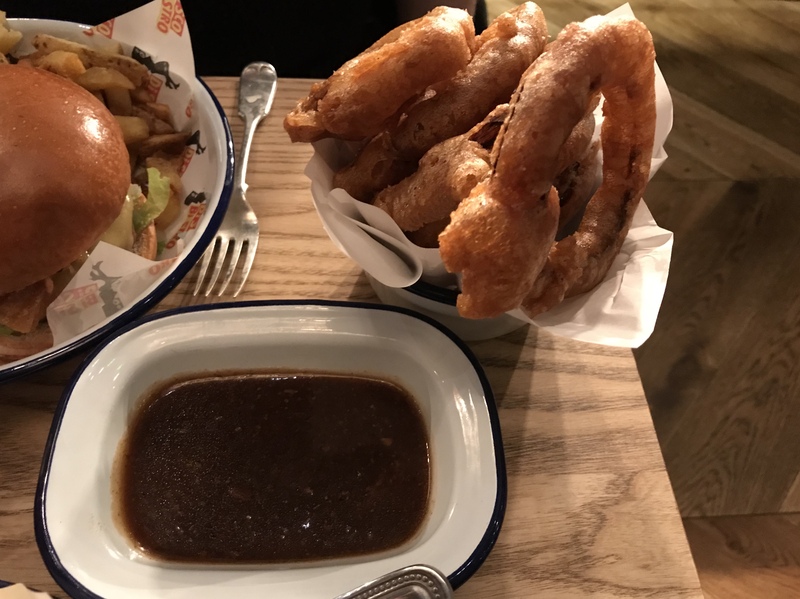 The onion rings were more successful – huge hoops of onion and batter, perfect on their own, let alone dipped in the gravy. A note of something in the batter – possibly fennel seed or cumin – added a little complexity and, impressively, they didn’t feel heavy or greasy in the slightest. We shared a portion of these, and by the end I’d say we were nicely full without being unpleasantly stuffed. If I’d had room I might have gone for a salted caramel milkshake, but I figured there would be other times. Dinner for the two of us came to almost bang on forty pounds, not including tip. I haven’t mentioned the service, but it was unobtrusively good. The restaurant was very full on a weekday night – buzzy but not deafening – yet the staff never seemed fazed at all and did a good job of looking after a large amount of tables without letting anything slip. Honest have clearly put work into this, and I appreciated the fact that the staff were friendly without being cheesy or overfamiliar, or upselling, or any of those other bugbears that so plague casual dining. Hip without being hipster indeed: perhaps Tim was right. I’ve never been the biggest fan of burgers or the burger trend (it’s just a sandwich, as I like to say), and I went to Honest curious to see whether they could do enough to overcome that. I’m delighted to say that they did. Honest is a very particular type of restaurant – it’s not one to linger in, and their emphasis probably is on getting you in, feeding you from a relatively limited menu and getting you out again. But to their credit they do that without making you feel like a commodity or making the food into an afterthought: I admire that about them. Normally in this situation I would say “it’s not for everybody” but actually, Honest has pretty wide appeal. I could see myself eating there pre-theatre, grabbing a quick meal on my way home from work, meeting up with a friend pre-pub or having a big lunch, and that’s before we get on to the very tempting-looking weekend brunch options. I do wonder what it will be like come summer, and how exactly the top bar will end up being used on evenings and weekends, but it definitely adds something to Reading. 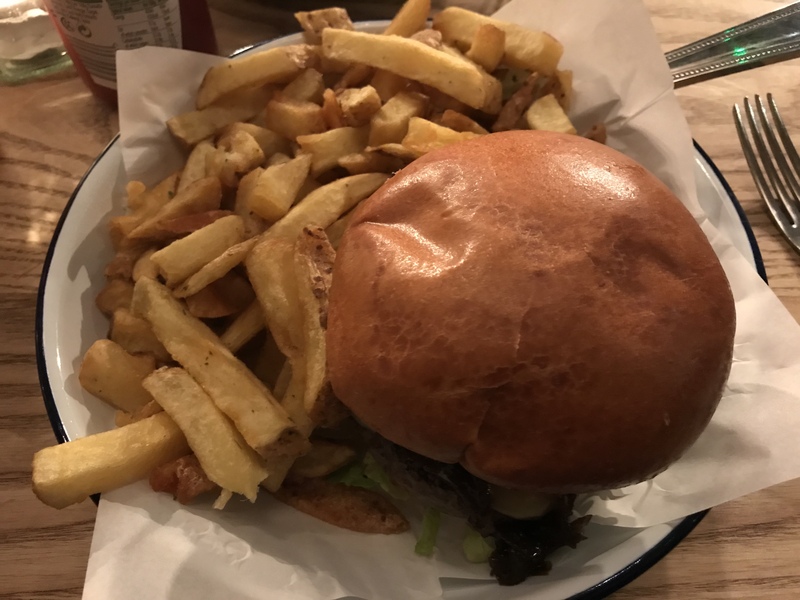 I’d say it’s far and away the best burger in Reading – miles better than 7Bone, and if I was Handmade Burger Company right now I’d be very nervous indeed – but moreover Honest is somewhere you might actually visit in its own right. I don’t know what the future holds for Reading – whether we’ll ever strike out and celebrate our identity the way Bristol or Brighton do or whether, under the business-centric influence of our nebulous quangos we’ll just become a creeping extension of London. But I hope Honest heralds the shape of things to come, and if we do get new restaurants they’ll pick up a little of what makes Reading so special. After all, the guys from Honest came here and fell in love with the Nag’s Head – and those are exactly the kind of restaurateurs we want, if you ask me.